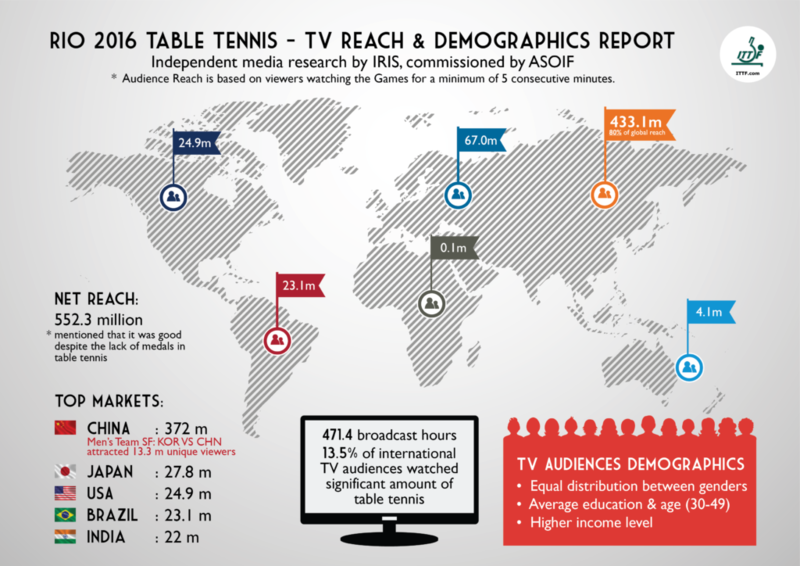 552 million TV viewers during the Rio Olympic Games in 2016, table tennis has a true global audience. Repucom reported in 2015 that 21% of the global population had an interest in table tennis. Broadcast for table tennis has a TV reach of 170 countries. Independent analysis was completed during the Rio 2016 Olympic Games to measure broadcast time and reach of all sports. Table tennis attracted a significant audience with over ½ billion people who watched our sport from all around the world. We were also able to understand another element of table tennis viewer demographics, something that we continue to work on to build important insights and knowledge of our sport and fans. The Liebherr 2017 World Championships broke previous broadcast and social media figures, you can read more here.